Kids flourish more when connected with nature. 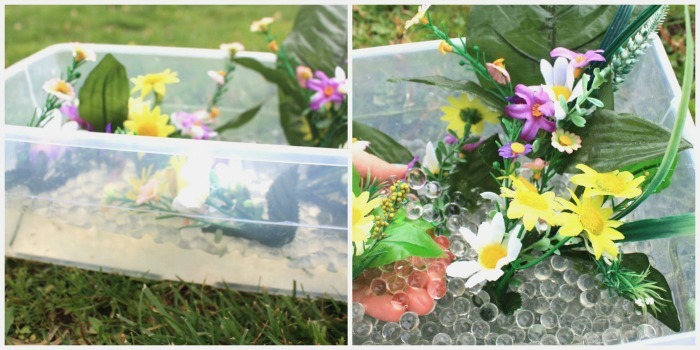 And this fun garden sensory bin can be made rain, sleet, snow or sunshine to ensure those little minds keep growing! Katie from Views From a Step Stool is sharing with us how she encourages her little ones to get in some garden sensory and pretend play. This post contains affiliate links. Spring is the perfect time to start gardening with kids! By planting either a flower or vegetable garden with your little ones, you are giving them a hands-on, educational experience about the plant life cycle. Planting any kind of garden is a great opportunity to talk about seeds, germination and plant growth. This sensory bin allows kids to explore this process through touch and provides many opportunities for fine motor practice! 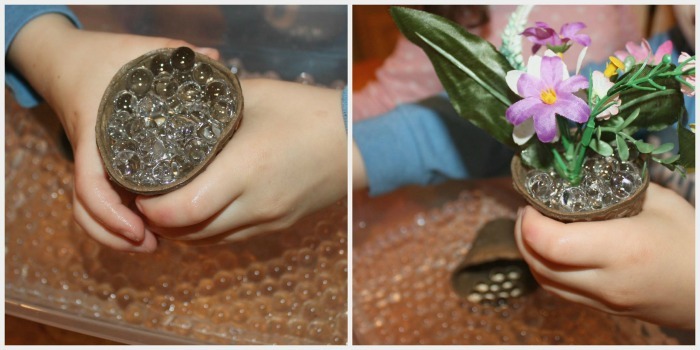 Water beads are one of our all-time, favorite sensory bin starters. They are super squishy, squiggly and are fun to “make!” They start out as little hard balls. But when submerged in water for a few hours, they absorb the water they are in and grow to be about the size of a marble. My kids love to scoop, dump, bounce and squish them for hours (yes really!). Water beads come in all colors, but for this sensory bin we decided to use clear water beads to that we could see through our ‘water bead soil’ to the flowers’ roots. I encouraged my kids (1, 3 & 5) to fill some small biodegradable flower pots with the water beads and plant a silk flower in the pot. These activities provide a lot of fine motor practice all through play! We also discussed what the word ‘biodegradable’ meant. The kids watched as the pots became saturated with water and began to break down as they played with them, just as they would if they had been planted in the ground. Using a clear bin gave us the opportunity to look inside the layer of the water beads at the stems of the flowers and discuss how the root of the plant grows underground, and how on the top of the soil, the plant with the flowers is visible. Children learn best when they engage all of their senses. 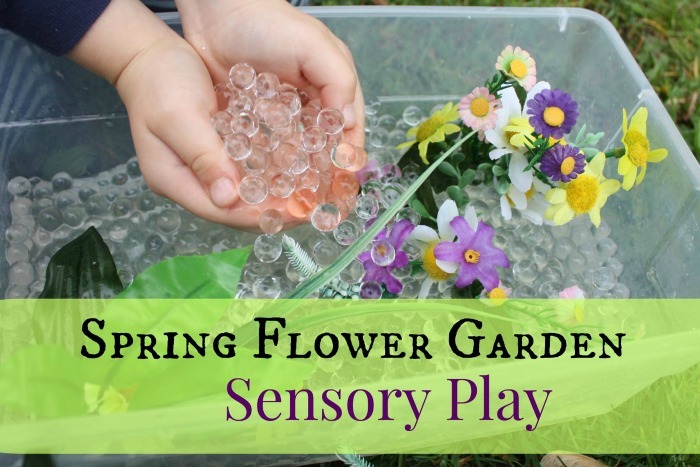 By taking a concept, such as the plant life cycle, and discussing it through sensory play, children are more likely to retain the information and understand the process better. 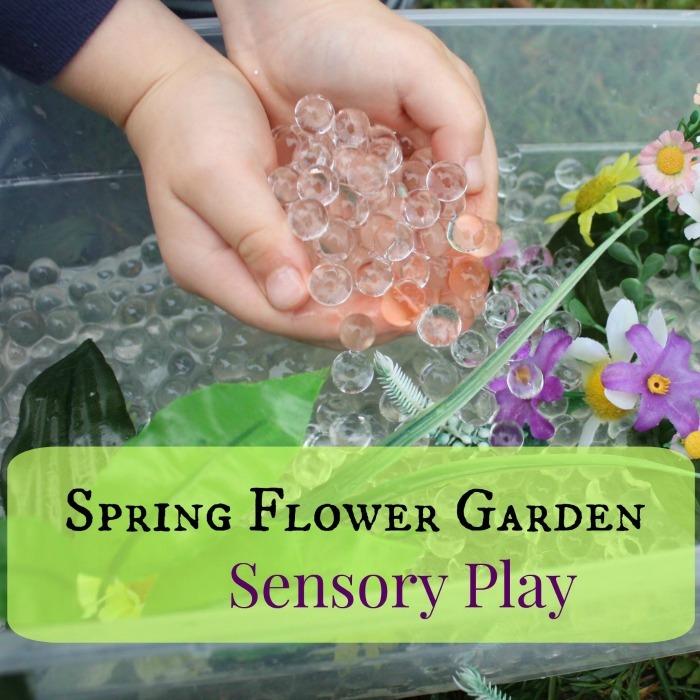 Additionally, sensory play is fun! What a great way to keep the kiddos busy… and learning! 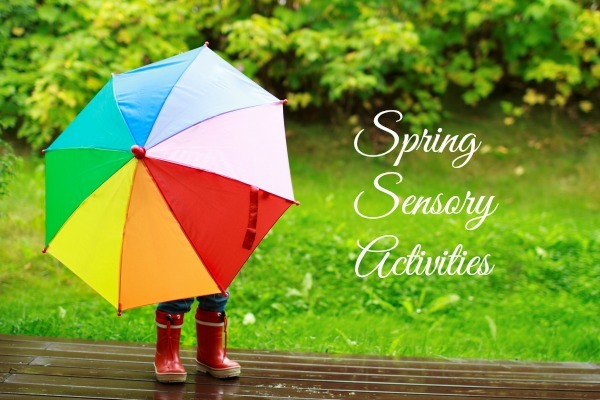 This post is part of the Spring Sensory Activities series, hosted by The Jenny Evolution in partnership with The Sensory Spectrum. About Katie: Katie is passionate for play-based learning and implementing this into her daily life with her kids. Katie’s focus as a mom is that her children learn how to be creative, use their imagination and think out of the box. You can read more fun adventures from Katie at Views From a Step Stool. Cute! I just ordered some water beads for the first time. I cannot wait to try them out and make this.